The city of Estacada is a historic town, having been incorporated way back in 1905. It was around even before that, as workers building the hydroelectric dam on the nearby Clackamas River camped here. 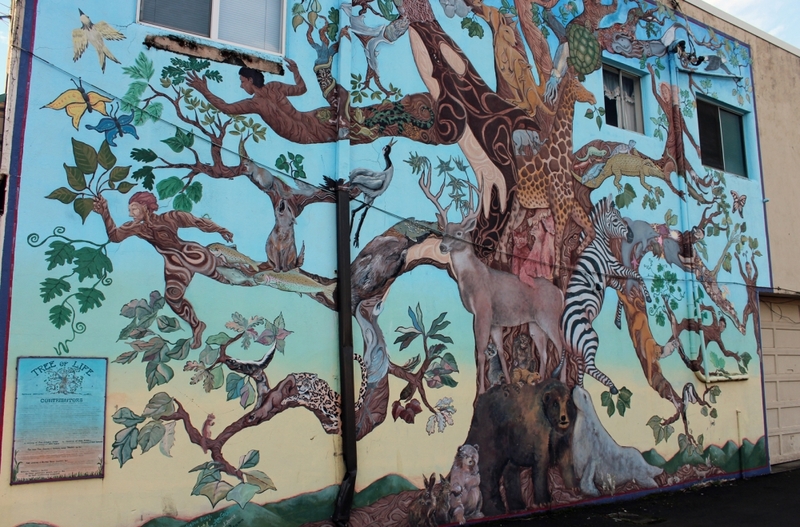 There’s a lot of history here, and it’s been memorialized in a unique way: the creation of more than 20 murals on buildings throughout the community. The Artback Artists Cooperative program first started back in 1992 when a group of local artists created the first mural. The response was so resoundingly positive that they quickly realized they had something special going on and started adding a new mural each year. Each one has a different theme, highlighting the town’s heritage aspects, like Native American history or logging background. A mural celebrating the Barlow Road section of the Oregon Trail that went through Estacada is in the process of being restored and will be located at nearby Philip Foster Farm. The murals let visitors truly connect with the town in a much more authentic manner. Plus, while strolling the streets looking at the artwork, visitors can take the opportunity to sample some craft beer at Fearless Brewing. They say the beer is so good because it’s brewed from the magical waters of the Clackamas River. Not to try to influence you too much, but we tend to agree. Of course the Clackamas River is good for things other than making excellent beer. It’s also known as one of the best white water rafting locations out there, which is pretty exciting considering we’re only 20 or so minutes from Portland. Each fall Estacada puts the “fun” in fungus as it draws foragers searching for mushrooms and truffles. If you’ve never tried it and would like to learn more, the Estacada Festival of the Fungus helps newbies get into the world of mushroom foraging. With all you’ll be doing, you’ll need to stay a few days. Check out Promontory Park for excellent camping just outside of town. In addition to excellent camping, they have fishing, boating, hiking trails and a marina that just got remodeled last year.